Aspect-oriented programming is still largely code-centric. This is not surprising, as OOP went through the same process: early emphasis was on coding, and it took quite a few years before OOD was ready for prime time. The truth about OOA is that it never really got its share (guess use cases just killed it). This is not to say that nobody is thinking about the so-called early aspects. A notable work is the Theme Approach (there is also a good book about Theme). Please stay away from the depressing idea that use cases are aspects; as I said a long time ago, it's just too lame. My personal view on early aspects is quite simple: right now, I mostly look for cross-cutting business rules as candidate aspects. I guess it's quite obvious that the whole "friend gift" concept is a business rule cutting through User and Subscription, and therefore a candidate aspect. Although I'm not saying that all early aspects are cross-cutting business rules (or vice-versa), so far this simple guideline has served me well in a number of cases. It is interesting to see how early aspects tend to be cross-cutting (that is, they hook into more than one class) but not pervasive. An example of pervasive concern is the ubiquitous logging. Early aspects tend to cut through a few selected classes, and tend to be non-reusable (while a logging aspect can be made highly reusable). This seems at odd with the idea that "AOP is not for singleton", but I've already expressed my doubt on the validity of this suggestion a long time ago. It seems to me that AOP is still in its infancy when it comes to good principles. Which brings me to obliviousness. Obliviousness is an interesting concept, but just as it happened with inheritance in the early OOP days, people tend to get carried over. Remember when white-box inheritance was applied without understanding (for instance) the fragile base class problem? People may view inheritance as a way to "patch" a base class and change its behaviour in unexpected ways. But truth is, a base class must be designed to be extended, and extension can take place only through well-defined extensions hot-points. It is not a rare occurrence to refactor a base class to make extension safer. Aspects are not really different. People may view aspects as a way to "patch" existing code and change its behaviour in unexpected ways. But truth is, when you move outside the safe realm of spectators (see my post above for more), your code needs to be designed for interception. Consider, for instance, the initial idea of patching the User class through aspects, adding a data member, and adding a corresponding data into the database. Can your persistence logic be patched through an aspect? Well, it depends! there would be no way to participate to the transaction from an aspect. You would have to refactor your code, e.g. by moving the SQL part in a separate method, taking the transaction as a parameter. Can we still call this obliviousness? That's highly debatable! I may not know the details of the advice, but I damn sure know I'm being advised, as I refactored my code to be pointcut-friendly. Is this really different from exposing a CreateSubscription event? Yeah, well, it's more code to write. But in many data-oriented applications, a well-administered dose of events in the CRUD methods can take you a long way toward a more flexible architecture. A closing remark on the SOA part. SOA is still much of a buzzword, and many good [design] ideas are still in the decontextualized stage, where people are expected to blindly follow some rule without understanding the impact of what they're doing. In my view, a crucial step toward SOA is modularity. Modularity has to take place at all levels, even (this will sound like an heresy to some) at the database level. Ideally (this is not a constraint to be forced, but a force to be considered) every service will own its own tables. No more huge SQL statements traversing every tidbit in the database. Therefore, if you consider the "friend gift" as a separate service, it is only natural to avoid tangling the User class, the Subscription class, and the User table with information that just doesn't belong there. In a nutshell, separating a cross-cutting business rule into an aspect-like class will bring you to a more modular architecture, and modularity is one of the keys to true SOA. Note: I began tinkering with this idea several months ago, inspired by some design work I was doing on a real-world project. Initially, I thought I could pimp up this stuff into a full-fledged article. Months came by and I didn't, so (in the spirit of my old concept of Blogging as Destructuring) I thought I could just as well say something here instead. In most cases, the underlying database schema wouldn't be much different. In a real case, there might be different kind of services, each requiring a derived class, but we can ignore this issue right now. Also, there might be several kind of subscription (time-based, pay-per-use, and so on), but again, let's ignore that issue right now, and just concentrate on time-base subscriptions. A subscription can be renewed at any time. 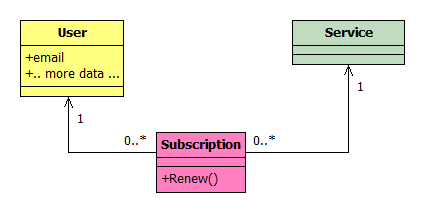 In the object model, this would translate into a Renew method in class Subscription. Renew could take a parameter, like the extension of the renewal. Most likely, it would add a new record to the Subscription table (to keep track of the whole subscription history for that user), and possibly create a new Subscription object. So far, so good. Now the marketing guys come up with a nice idea: whenever you register, you can provide the email address of a friend who has already registered. If you do, everytime you renew a subscription your friend will get some kind of gift, like a free extension or whatever. This may generate a few more leads, meaning a little more business. From a purely OO mindset, this may lead us to perform a little maintenance on the existing model. 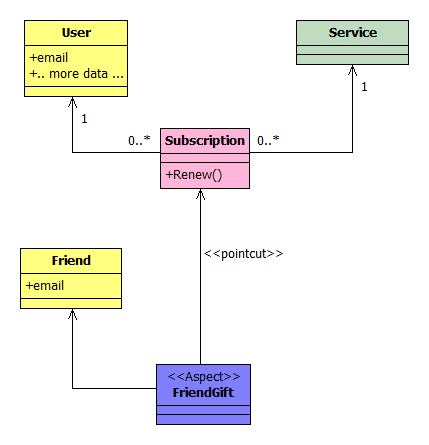 We can add a relationship from User to User to model the "friend" relationship, or we could just add a field like friendEmail (possibly left empty). At the database level, adding a field is probably easier. We can also modify the Renew method to check for the presence of a friend in the subscribing user, and if so, invoke some Gift logic. I won't draw a modified diagram for this scenario: I guess it's just too obvious. Now, this approach obviously works. However, you may recognize that the whole "friend gift" concept is a cross-cutting concern: it cuts through User (requiring new data) and through Subscription (requiring new logic). More on detecting cross-cutting concerns during analysis and design (and on the difference between cross-cutting and pervasive concerns) next time. In the AOP world, we could approach the problem differently. We could define a FriendGift aspect. The aspect may add a new data member to the User class (the friendEmail), and intercept the persistence logic to save / load that data from the database. The aspect may also intercept Renew and perform the Gift logic if required. Actually the aspect doesn't have to modify User (class and table); indeed, it would be better not to, as the persistence logic might not be easy to intercept (more on this next time). The aspect could just use a different database table to store the friend email. 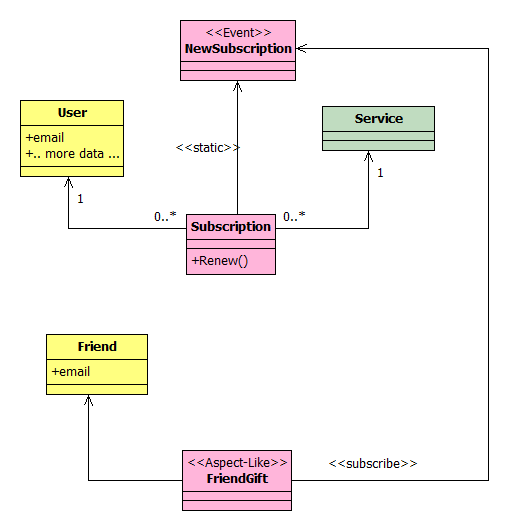 Interestingly, the database is probably different from the previous scenario: Friend would map to its own table. What if we are not using an AOP-enabled language? For instance, we might be using plain old C#. Can we still borrow some ideas from the above? I believe so. In the same sense as OO thinking can inform traditional structured programming, AOP thinking can inform traditional object oriented programming. No rocket science here :-). Just a different form, same function. Different database, a more general Subscription class, unaffected by a business rule which may change at any time. Also the User class and table are left unaffected. More on this, and a few comments on the SOA part, in just a few days (I hope :-).